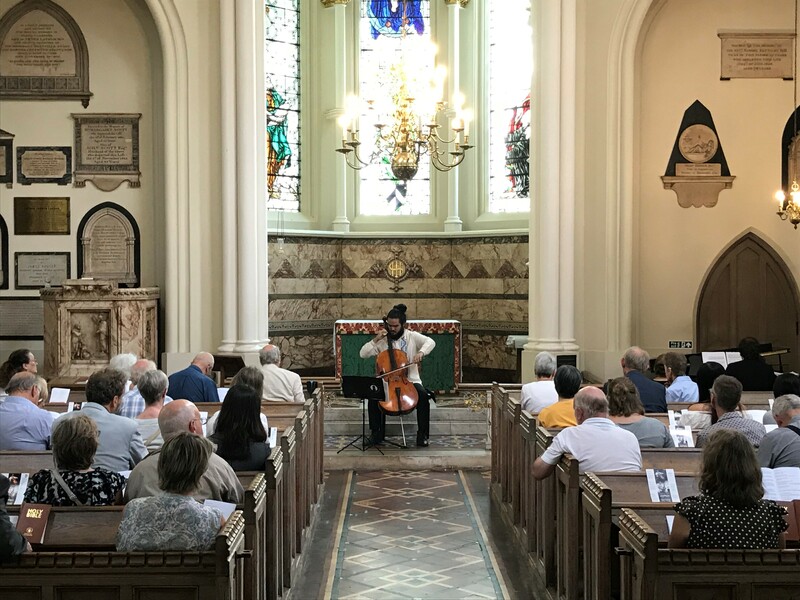 On 28th June 2018 we brought a Day of Music to St Bartholomew’s Hospital. Three events in three historic spaces around the hospital grounds. We started the day with a lunchtime recital in The Hospital Church of St Bartholomew the Less, or ‘the less’ as it’s known. Performing under its stunning octagonal ceiling, Mexican cellist Abner Jairo Ortiz García played to packed pews with fellow CMF Artist, pianist Mihai Ritivoiu. Jairo is our second CMF Mexican International Scholar and this concert (his London debut) formed part of his six-week CMF experience, which also includes professional development workshops, a photo shoot, creating a promotional video and bespoke website, and individual artistic and business mentoring. We’ve even organised a trip to Paris! As the recital drew to a close, the stage was nearly set for an afternoon of outdoor jazz. 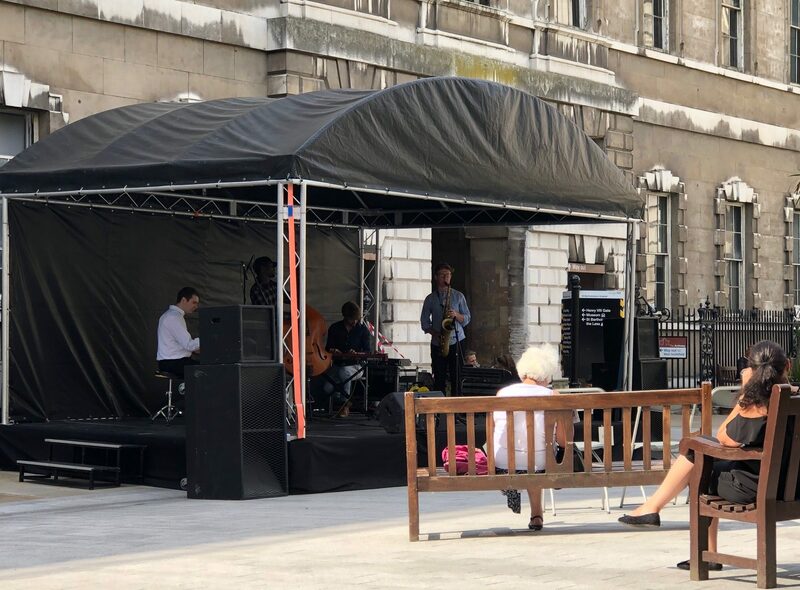 As well as historic churches, halls, and museums, the hospital is blessed with a large leafy square; over the years we’ve had great success with outdoor music – both at the City Beerfest and Live in the Churchyard on Cheapside) – so it was a no-brainer to bring jazz to the Hospital Square. Hot off the back of his first UK tour and the release of his debut EP, saxophonist Alex Hitchcock (2017 CMF Artist) entertained patients, hospital workers, local workers, and passers-by with three sets of standards and original compositions. As the sun began to disappear behind the hospital walls and the shadows began to grow, an intrepid audience arrived for the third and final event of the day: Death Speaks. 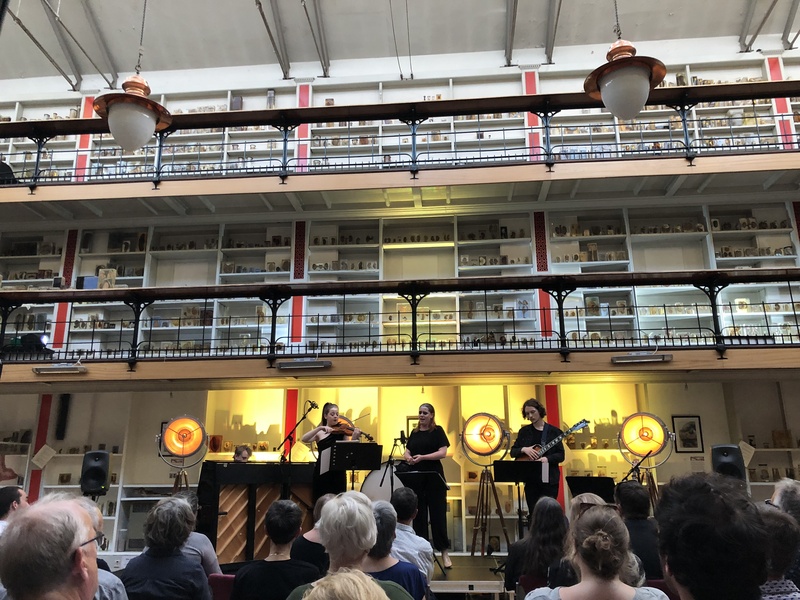 This our sold-out headline event, was the brainchild of mezzo-soprano Lotte Betts-Dean (2017 CMF Artist) and guitarist Andrey Lebedev (2015 CMF Artist), one which couldn’t have been more suited to its venue: Barts Pathology Museum. Situated at the top of the hospital and not often open to the public, The Pathology Museum (part of Queen Mary University of London) is a Grade II Listed Medical Museum, which houses over 5000 medical specimens displayed over two mezzanine levels. Surrounded by these vivid reminders of our mortality, Death Speaks presented an evening of music musing on the end, the one certainty in life; the one thing about which we know the least. 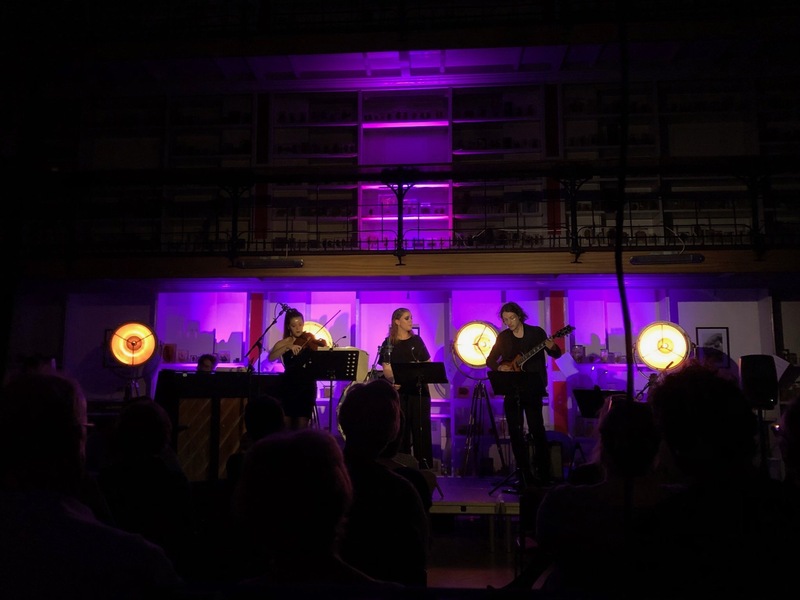 Leaving very few musical stones unturned, the programme meandered through folk song, lute song, lieder, indie rock, and baroque opera before winding up at the evening’s namesake. The performance culminated in death speaks, a haunting song cycle by Pulitzer Prize-winning composer David Lang. Premiered alongside his acclaimed the little match girl passion (a fusion of Hans Christian Andersen’s short story and Bach’s St Matthew Passion), death speaks continues its moving comparison between the worlds of the living and the dead. Revisiting Andersen’s tale, Lang was reminded of the frequent occurrence of Death as a character in the songs of Franz Schubert (e.g. Death and the Maiden). In an attempt to create a fuller picture of this elusive being, Lang scoured every single Schubert song text, compiling every instance of when Death speaks. After roughly translating and trimming passages from 32 songs, Lang assembled them to create these five songs. 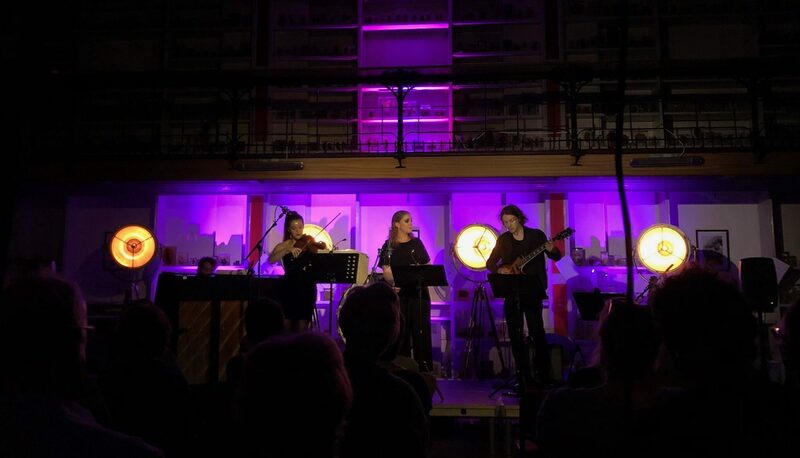 To transform the museum into a concert venue we brought in a stage, sound equipment and lighting; the lighting in particular played a key role in creating an immersive musical experience. One of the many things which makes the museum unusual is its glass ceiling. As a result the evening had the palpable sense of a journey, from light to dark, from day to night; a journey from life to death. This concert, this whole of day is just the beginning of CMF’s relationship with the hospital and The Hospital Church of St Bartholomew the Less. CMF has been looking for its own space, its own home for some time, a place to host our many core activities (concerts, workshops, rehearsals etc.) and our office. CMF is currently exploring – with the Parish of Great St Bartholomew and other stakeholders – the possibility of making St Bartholomew the Less our permanent home in the City of London. Watch this space for announcements about this and our 2018-19 concert season!